Claud Daniel 'C.D.' Mayfield, Jr.
Claud Daniel 'C.D.' Mayfield, Jr., son of Claud Daniel Mayfield, Sr. and Nancy Florence Caffey, married to Mary Ravinell Smith and buried in Tuscola Cemetery, Tuscola, Taylor County, Texas. South Taylor County Independent School District Custodian (1956-1957). 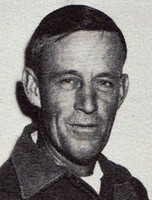 First Jim Ned Consolidated Independent School District High School Custodian (1957-1966).